1930's Exide Battery Service Station invoice. Homepage. This page: A pre-war invoice from Shemelds Limited, an authorised Exide battery retailer of the 1930s. 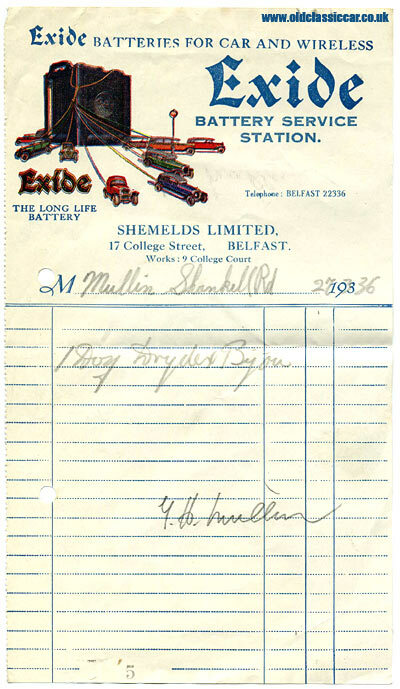 Evidently Shemelds Limited was a supplier of Exide motor-car and wireless batteries in the 1930s, and to this day there is a firm of a similar name supplying electrical equipment in Belfast. This handwritten invoice dates to March 1936 and, while I'm not quite sure what product was being purchased, the illustration at the top of the invoice is enough to see it added to this section of the site. A fleet of motor-cars are shown speeding away from a giant rubber-cased battery, just the job for any pre-war automobile. Few of the pre-war illustrated invoices I've turned up are in colour, which makes this one a little unusual. The company was situated at 17 College Street in Belfast, but other than references to Exide long-life batteries, there are no clues as to what else - if anything - the firm traded in. The customer was a Mr or Mrs Mullin, of Shankill Road, a road associated more often than not today for various paramilitary bombings and other terrorist activities in the 1970s. A number of leaflets relating to Exide in the 1960s can be found on this page.